The Model X slammed into a highway barrier in the Northern California city of Mountain View on March 23. The driver later died at a hospital. The National Transportation Safety Board (NTSB) is investigating. Two other vehicles were involved in the collision. 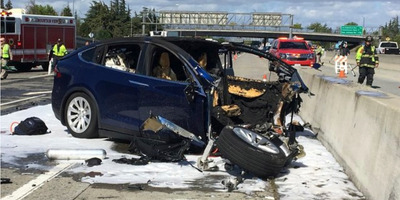 It is the second collision involving a Tesla operating on Autopilot that the NTSB has investigated so far this year. The agency was also looking into a Model S sedan that collided with a fire truck in the Los Angeles suburb of Culver City in January. The Autopilot system is designed to warn drivers whenever it detects that the driver’s hands are not on the wheel. The severity of those alerts gradually escalates if the driver does not respond. The Autopilot system eventually deactivates itself if the driver ignores the warnings.